In this lesson, we will learn about the CSS building blocks for laying out pages. In the next lesson, we'll learn how to use these building blocks to create common layouts. Work with the position property. Work with the top, bottom, left, and right properties. Work with the z-index property. Work with the float property. Work with the clear property. The flow is the way in which elements are laid out. By default, sibling elements are all in the same flow and positioned statically on the page; the order elements appear on the page is the same as the order they appear in the code. With CSS, we can move elements into a separate flow. This allows us more control over the design of the page and over the layout of our code. When elements are positioned absolutely, they are removed from the normal flow. As a result, they do not affect the positioning of subsequent sibling elements. Elements are positioned absolutely by setting the position property to absolute and specifying one or more "offset" properties. The "offset" properties are top, right, bottom, and left. Their values can be specified in number of units (e.g., 10px) or percentage of the containing block (e.g., 20%). These properties offset the element from its nearest non-statically positioned containing block element (i.e., with position set to absolute, relative, or fixed). If it has no ancestor that is non-statically positioned, then it is offset from the browser window. Notice how the positioning of the sibling h2 and div elements is not affected by the h1 element that precedes them. This is because the h1 element has been absolutely positioned. You'll notice that Firefox doesn't put the element at the very bottom of the window. The distance from the bottom will vary between browsers, but all of them seem to give some buffer. Notice that the h1 element is fully contained in the "wrapper" div. Note that when an inline element is positioned absolutely, it become a block-level element. When elements are positioned relatively, they are positioned relative to where they would normally appear in the flow. Unlike absolutely positioned elements, relatively positioned elements do affect the positioning of subsequent sibling elements. Elements are positioned relatively by setting the position property to relative and specifying one or more "offset" properties as described above in "Offset Properties: top, right, bottom, and left". The code above will render the following results. Notice how the paragraph text is positioned as if the h1 element had not been moved from its default position. This is because the h1 element has been relatively positioned. As the h1 element would normally be in the upper-left corner, it is pushed out of the browser window. 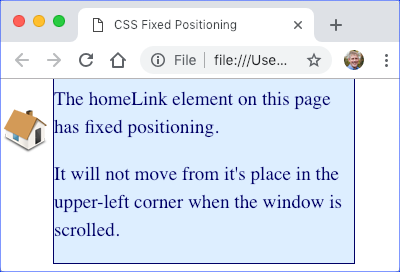 Elements with fixed positioning stay in the same position in the browser window even when the page is scrolled. It can be used to keep an element (e.g., a navigation menu) on the page at all times. 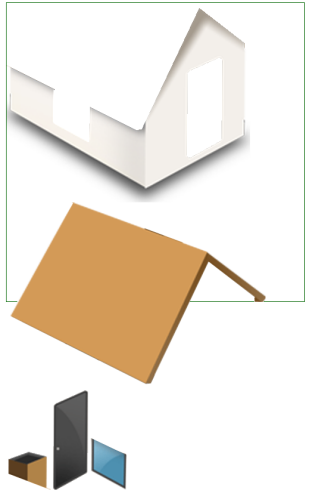 The example below uses fixed positioning to keep a home icon that links to the home page in the upper-left-hand corner. Notice that the home icon remains on the screen. 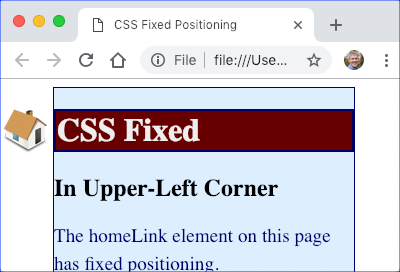 In this exercise, you will build a house from its individual parts using CSS positioning. Your job is to build the house in the center of the green box. It will take some trial and error. If you used absolute positioning, try doing it again with relative positioning. If you used relative positioning, try doing it again with absolute positioning. Find grass.jpg in the PositioningAndVisibility/Exercises/Images folder. Use it to put your house in a nice new yard. The z-index property specifies the stack level of an element on the page compared to other elements in its same flow. It takes a number as a value. The higher an element's z-index, the closer to the user it appears. Notice how some div elements sit on top of the others. If you switch their z-index values, they will stack the differently. inline, for elements like <span>, <img>, <a>, and others. The three paragraphs of "greeking" (fake text) each contain two span elements, with position block (at top), inline (middle), and inline-block (bottom). The inline and inline-block elements do not force a line break, sitting next to the content either side of them. The block and inline-block obey the width and height settings, while the inline element does not. The links (the a tags) behave like HTML table cells (like td tags): we can set them to have a width of 1/3 of the total table width and can align their content both vertically and horizontally. The major difference between setting an element's visibility to hidden and setting its display to none is that a hidden element still affects the layout of the page, whereas an element that has a display of none does not. Float can be applied to any element that is not absolutely positioned. It is used to specify whether an element should float to the left, to the right, or not at all. Possible values are listed below. <p>This is just text. This is just text. This is just text.